I didn’t have time to revise it during the website redesign, but since I used a certain style and colour for the front page icons, I thought it might be interesting to try for the same look. The yellow arrow is taken from our banner (which is essentially the same as in the logo) then resized as needed. 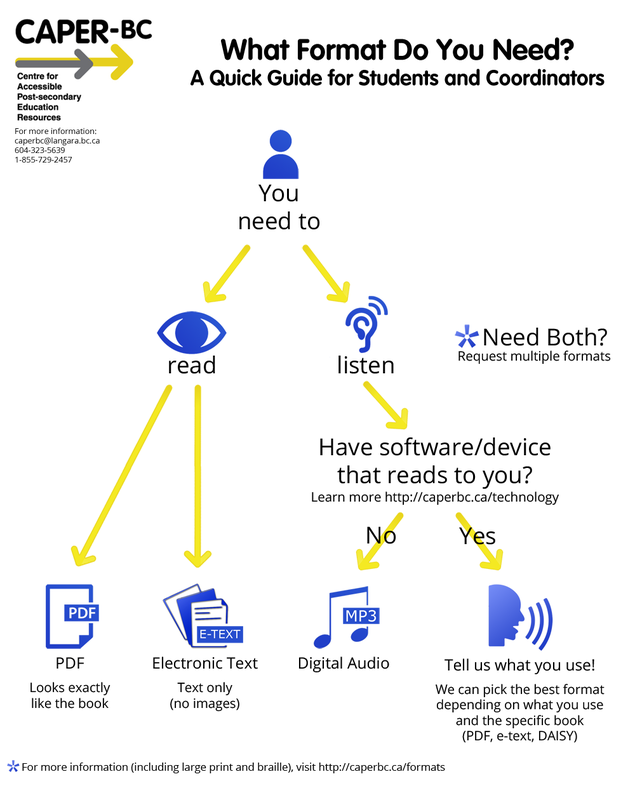 Description: The guide is a flow chart asking a question at each step to help make the decision on which accessible format best matches someone’s needs. choose e-text (text only, no images). listen. Do you have software or device that reads to you? If yes, then tell us what you use! 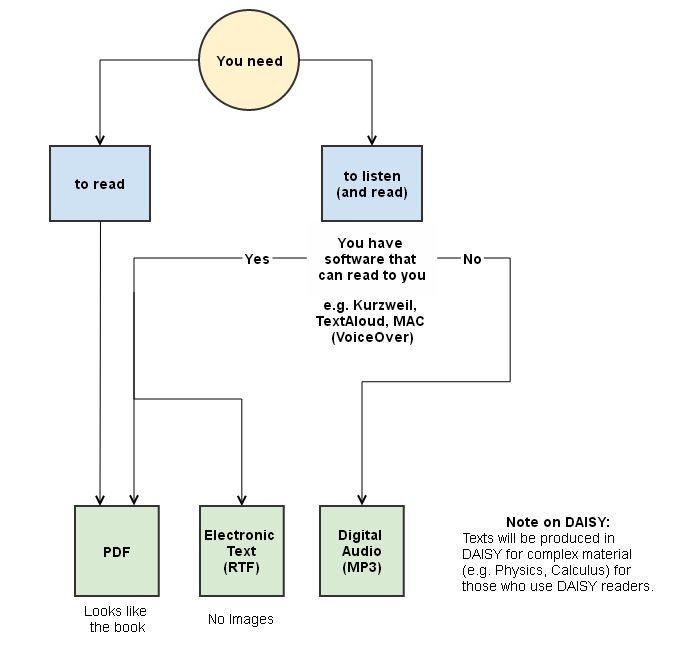 We can pick the best format depending on what you use and the specific book (PDF, e-text, or DAISY). If no, then choose digital audio (mp3). For those interested, I used PennState’s Accessibility’s guide on making accessible flowcharts and concept maps. There are some special cases and a couple of formats which are not really integrated into the guide, and simply mentioned in the more information note at the bottom. We rarely produce DAISY or large print (for various reasons), and don’t produce braille at all. What we will do is see if other institutions that we agreements with have it in their collection in which case we can borrow it for students. For the most part, students who need DAISY and Braille can use e-text in DAISY and refreshable braille devices, and large print users will use PDF. I wanted to keep the guide simple, because the point is to make the decision process easier along with the basic information that our users need to differentiate between the formats.